Simple condolence messages for loss to any family member may not be able to heal the wounds of a grieving heart, but it definitely plays a big role in proving solace and comfort. This can act like a balm on the wounded spirit of an individual. Losing a family member or close friend is like losing a part of our self which is hard to replace. When we are dealing with the pain of losing someone really close to our heart, we don’t seek sympathy. We seek a little bit of love and empathy from the people near us. 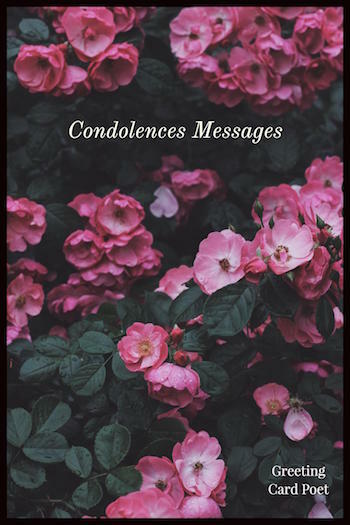 These condolence messages for loss would surely make any depressed soul feel a little lighter and happier, knowing that they are not alone in this world fighting the cruel forces of nature. So sorry to hear of your loss. I pray that God will grant you the strength. My most sincere condolences. We are saddened to hear of your loss. Your husband was an amazing person to have around. I’m so lucky to have met him in this life. Your husband was a perfect gentleman and a great human being. He will be missed for his goodness in life. Sorry to hear about the loss. What an exceptional person your husband was. We hope that you are surrounded in love. We may not understand why he had to leave us so soon but we pray that God will comfort you and lift you up. Our prayers and thoughts are with you during this painful time that you have lost your husband. You are not alone. I am truly sorry to hear about your loss. Your mother was a great woman and she will be truly missed and will always be remembered. A mother is the most valued being on earth. No one and nothing can fill the void created by the loss of our dear mother. Please accept my condolences for the loss of your mother. She was a great woman and much admired. I’ll be thinking about you and you’re in my prayers. Thinking of you as you celebrate the remarkable life your mother led. God bless. 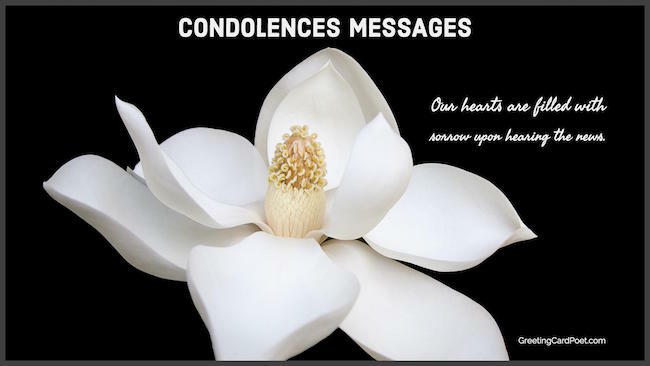 Tip: In addition to communicating these condolence messages on a sympathy card, some of them also work well as spoken words to those in need. We were sad to hear the news about your father’s passing. Our most sincere condolences. Your father’s passing has left an immense void – he truly was an outstanding man. Our thoughts are with you. Your father always bragged about how wonderful you were. I hope you know that you meant the world to him. He’ll be missed. Truly sorry for your loss. Holding you close in our thoughts and prayers as you go through this difficult time. May God shower light on your life ahead, and guide you through these sorry days. I can understand your pain, but the soul that is no more with us shall see peace and rest. Your loss is painful, and it is very difficult to come through such times. Keep faith in God, and he shall pour his love and care on you. We are always there to support you, take care. Saddened to hear of your loss. Our thoughts are with you. Hope you’re doing ok and saying many prayers for you. Let the memories of your brother bring you some comfort. Not as much as you and your family but we and many who believed in his rightness today suffer the great loss of your great man. No one can fully share the depth of your sorrow or convey the degree of their sympathy but the prayers and thoughts of each of us reach out to you and your children. Mrs. Kennedy is deeply appreciative of your sympathy and grateful for your thoughtfulness. Diana, Princess of Wales, was a friend and champion to all humanity especially to those in greatest need, often forgotten by others. The Princess brought the power of her presence, her compassion and her position to some of the most important humanitarian issues of our time, saving countless lives and bringing comfort to countless others. Her work to bring about a global ban on landmines did more to galvanize world opinion on this issue than any other single individual. Her death is mourned by an entire world. We at the American Red Cross share the grief of the British people in the loss of a national and global treasure. We will miss her special touch and the love that she so effectively expressed through action. I have asked that Red Cross flags in front of American Red Cross buildings be lowered to half-mast in her memory. Our thoughts and prayers go out to her sons, William and Harry, on the loss of their mother and to the families of those who were also killed and injured.